No matter where you live in the world you can see poverty. Poverty has been evident for a very long time and even in Jesus’ day He reminded them that “the poor always ye have with you” (John 12:8a). That being said, what else does the Bible say about poverty and the poor? 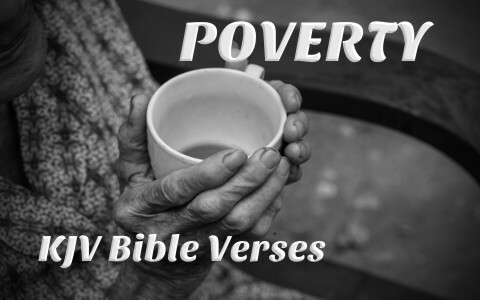 Here are some eye opening KJV Bible verses about poverty. Proverbs 6:10–11 Yet a little sleep, a little slumber, A little folding of the hands to sleep: So shall thy poverty come as one that travelleth, And thy want as an armed man. Psalm 14:6 Ye have shamed the counsel of the poor, Because the LORD is his refuge. Psalm 35:10 All my bones shall say, LORD, Who is like unto thee, Which deliverest the poor from him that is too strong for him, Yea, the poor and the needy from him that spoileth him? Psalm 113:7–8 He raiseth up the poor out of the dust, And lifteth the needy out of the dunghill; That he may set him with princes, Even with the princes of his people. Psalm 140:12 I know that the LORD will maintain the cause of the afflicted, And the right of the poor. What Should be Our Attitude and Service to the Poor? Leviticus 19:9–10 And when ye reap the harvest of your land, thou shalt not wholly reap the corners of thy field, neither shalt thou gather the gleanings of thy harvest. And thou shalt not glean thy vineyard, neither shalt thou gather every grape of thy vineyard; thou shalt leave them for the poor and stranger: I am the LORD your God. Leviticus 25:25–28 If thy brother be waxen poor, and hath sold away some of his possession, and if any of his kin come to redeem it, then shall he redeem that which his brother sold. And if the man have none to redeem it, and himself be able to redeem it; Then let him count the years of the sale thereof, and restore the overplus unto the man to whom he sold it; that he may return unto his possession. But if he be not able to restore it to him, then that which is sold shall remain in the hand of him that hath bought it until the year of jubile: and in the jubile it shall go out, and he shall return unto his possession. Leviticus 25:35–37 And if thy brother be waxen poor, and fallen in decay with thee; then thou shalt relieve him: yea, though he be a stranger, or a sojourner; that he may live with thee. Take thou no usury of him, or increase: but fear thy God; that thy brother may live with thee. Thou shalt not give him thy money upon usury, nor lend him thy victuals for increase. Deuteronomy 14:28–29 At the end of three years thou shalt bring forth all the tithe of thine increase the same year, and shalt lay it up within thy gates: And the Levite, (because he hath no part nor inheritance with thee,) and the stranger, and the fatherless, and the widow, which are within thy gates, shall come, and shall eat and be satisfied; that the LORD thy God may bless thee in all the work of thine hand which thou doest. Luke 14:13–14 But when thou makest a feast, call the poor, the maimed, the lame, the blind: And thou shalt be blessed; for they cannot recompense thee: for thou shalt be recompensed at the resurrection of the just. 1 Timothy 6:17–19 Charge them that are rich in this world, that they be not highminded, nor trust in uncertain riches, but in the living God, who giveth us richly all things to enjoy; That they do good, that they be rich in good works, ready to distribute, willing to communicate; Laying up in store for themselves a good foundation against the time to come, that they may lay hold on eternal life. God does not forget the impoverished. The Scriptures are filled with how He provides for them and how His saints are called to do the same. How can you help? More to read: What Did Jesus Say About the Poor? Previous post: Did Balaam’s Donkey Really Talk?